UPDATE TO THE UPDATE: Guess what?! Today is American Thanksgiving! Or, as we in Canada like to call it, Thursday. Happy Thanksgiving to my American readers. Enjoy the day off, and I'm VERY excited for the Macy's Thanksgiving Day Parade. For me, it's one of the highlights of November. I'll be really disappointed this year if the gigantic balloons don't make an appearance because of the high winds (but understandable; safety over balloons!). But more importantly...rest up! We've got some shopping to do tomorrow. UPDATE: It has come to my attention that in my desire to be awesome and pseudo-celebrate American Thanksgiving, I have managed to jump the gun and do so a week early. SO! Stop reading this blog. Stop it! GO AWAY! Just kidding. Please don't go away. But skip this entry! And come back in a week. Today I decided to do something completely different on my blog, because...well, because I can! 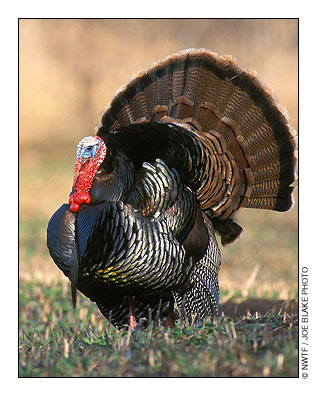 I was having a hard time coming up with another plant that screamed "Thanksgiving," since today is American Thanksgiving. I've already done two different species of pumpkins, and the only other suitable plant to blog about would be sweet potatoes...and those are a kettle of fish I was planning on getting into next year (still hasn't been done, despite my best intentions. One day!). So what other plant could I possibly blog about? There's no other typical vegetable of Thanksgiving that is universal to all celebrations, no matter where in the country you are. But then a colleague in the Biology Department, gave me a fabulous idea: why not blog about a recipe instead? Brilliant! So that's exactly what I'm going to do. 1. Tear up the bread by hand. Do it the way of the pilgrims. Food processors are the easy way out. Leave it chunky, don't make bread crumbs. 2. Chop up the onion. Dice it relatively finely, but not so fine it turns to mush when it starts cooking. 3. Put bread and onion in a giant bowl. Dump in your herbs. 4. Add in a little bit of water, and here's where your love comes in handy. Make sure your hands are clean, and mix that by hand. Mix, mix, mix. Still feels dry? Add a bit more water. Mix, mix mix. Still feels dry? Keep adding water and mixing until it's the desired consistency. Not soggy, but the bread sticks together with the mixture when you squish it into a ball. Feel free to make shapes here. I suggest snowmen. Use baby carrots as the nose. Take pictures! 5. Once you've got your desired consistency of stuffing, stuff it into your bird and enjoy the smell while it cooks. So how on earth can I turn this into a blog? Well, there are three obvious species here that can be featured in this blog, each of which I'll do in a mini-blog: wheat, onion, and sage. Here we go! Wheat is native to the Middle East, in a region known as the Fertile Crescent and was first thought to be domesticated almost 11,000 years ago. This is a region of the Middle East from which we get many of our most important crops in North America. 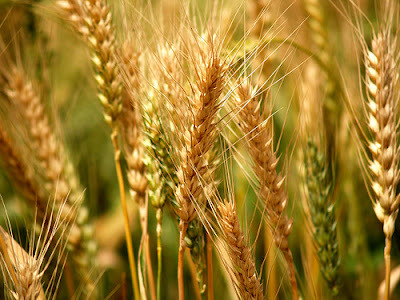 There are actually more than 20 species of wheat, each of which are used for different purposes. 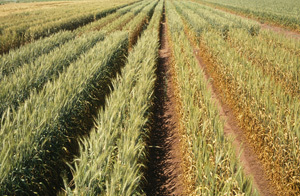 The most common way that species of wheat have been "created" over the last few millenia is through spontaneous tetraploidy. This means that the plants have undergone some sort of cell division problem that has caused all of the DNA of the plant to go into one pollen grain and none in the other, instead of half of the DNA going into each pollen grain. One of these pollen grains comes into contact with an egg that has done this same thing, and now an embryo exists with the complete genome of its mother plant and father plant (and sometimes this is actually the same individual; this is called "selfing"). If this happened in humans or almost any other animal, the embryo would not be viable. In plants, however, this is incredibly common and probably the most common method of creating new species of plants. This is a pretty remarkable adaptation, too; think about how much genetic variation could be available to an organism containing four copies of each gene instead of only two! The expression rare recessive diseases would essentially be eliminated from the population. Some common wheat species that we use are the diploid T. aestivum which is mainly used for flour that goes into breads and cakes; T. durum (tetraploid), used for making pasta and couscous, is low in gluten; T. dicoccum (diploid), also known as emmer, is used for breadmaking in Egypt and some parts of Europe; and T. spelta (hexaploid), an ancient form of wheat (popular during the Middle Ages) still used now as a low-gluten equivalent to bread wheat. Onions are probably native to Central Asia, but there is much uncertainty about where they originated. 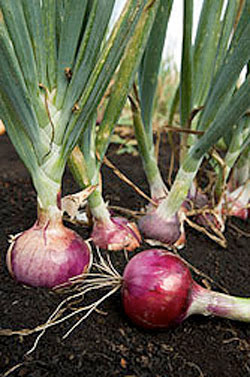 Onions as a species are only known from cultivation, which is incredibly unusual as far as crop plants go. It is possible that it has gone through so many rounds of human selection that it is now genetically distinct from its ancestral species (the most likely explanation), or the ancestral species has now gone extinct (the unlikely explanation). 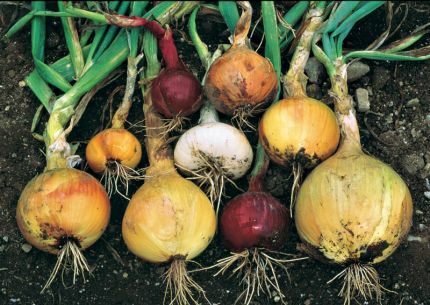 There is one species, A. asarensefrom Iran, that is genetically very closely related to the common onion. All species of the genus Allium produce sulphur compounds, which give them their pungent smell. When these sulphur compounds come into contact with water they produce sulphuric acid, one of the most potent acids known. This is the chemical basis for the "IT BURNS MY EYES!!!!" reaction most people get when cutting onions. The easiest way to get rid of this effect is by refrigerating your onions before use, or putting them briefly in the freezer before chopping (just enough to make them cold, not frozen). This prevents the cut onion from being able to "bleed" as much as a non-refrigerated onion, contributing to less eye-burn. Also, make sure you wash your hands with soap before rubbing your eyes. Some people say plugging your nose also helps; I think it's more the silliness factor than anything else. The sulphur compounds are still becoming airborne and the mucous membranes of your eyes still contain a lot of water, so the chemical reaction cannot be modified by plugging your nose. I would contribute that to the placebo effect more than anything else. These sulphur compounds in onions (and garlic) have been exploited medicinally by humans for centuries. Yes, onions do have medicinal properties! They are very potent against bacteria and fungi, and so are popular for treating colds, the flu, and, of all things, Athlete's Foot. If you suffer from this (quite disgusting) fungal infection on your toenails, put some freshly chopped warm onions in a pot of warm water. Submerge your feet for a while, rinse, and pat dry. Fungi are incredibly intolerant to sulphur, so this should take care of them in a jiffy. In fact, many creams for Athlete's Foot exploit the natural sulphur-containing chemicals of onions! 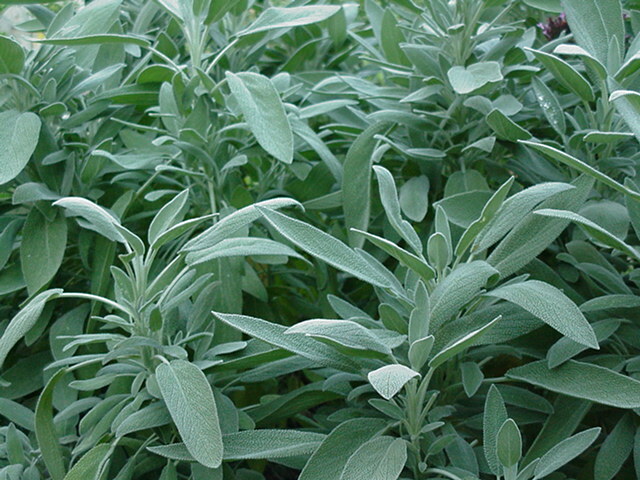 Sage is one of the most popular seasonings in the world, let alone in North America. 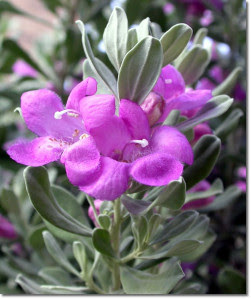 The sage plant is native to the Mediterranean Region of Europe and Africa, where it still grows commonly in the wild. In North America it has the potential to become an invasive species in warmer climates, so just be careful if you plant it outside. It doesn't seem to tolerate Canadian winters well, or if it does it rarely spreads beyond where it was originally planted. The flower is incredibly characteristic of the mint family; it is purple, has a darker eyespot than the rest of the flower, the male and female parts of the flower overhang the bottom petal of the flower, and features a large bottom petal that can act as a "landing pad" for bees for pollination. This flower is very specialized for pollination by insects that can see ultraviolet light, and the reproductive parts have been modified to ensure that pollen gets onto that "secret spot" on the back of the bee's neck where it cannot access the pollen to groom it off of itself mid-flight. Bees actually love being covered in pollen by flowers not because they enjoy pollinating flowers, but because they pack this onto specialized areas on their legs to take back to the hive to feed the young larvae. Without the ability to put pollen onto the back of a bee's neck, the flower will be incredibly inefficient at cross-pollination, and will essentially be giving away its sperm to be used as bee food. Some biologists argue that bees are the most inefficient pollinators in the world! Sage also has some demonstrated health benefits and medicinal uses, although it is reported as being able to treat much more than it has actually been shown to do. One of the most promising uses of sage leaf extract (containing a combination of a huge number of essential oils; the exact combination of different chemicals has never successfully been created in a lab) is as a treatment for hyperlipidemia, or an increased level of lipids in the blood. This isn't just equivalent to obesity; in fact, obese people are incredibly efficient at filtering fats out of their blood and storing them in fat tissues (hence the obesity). This is more a result of a vast variety of genetic diseases that cause, sometimes for unknown reasons, lipids to build up in the blood. Other times it can be acquired due to various other medical conditions, the two most common being diabetes and renal failure. Chronic high levels of lipids in the blood can be incredibly dangerous to the circulatory system because it changes the viscosity of the blood, causing the heart to work harder. This can lead to different kinds of heart disease, heart attack, and stroke. Happy Thanksgiving to all my American readers!